Just a month before the government announced a redress scheme for the thousands of impacted homeowners, Karl Murtagh was told his mortgage had been sold. A FAMILY AFFECTED by the use of concrete blocks with mica in their homes was told just weeks before the announcement of a new scheme to assist them that their mortgage had been sold to a vulture fund. Faced with a choice between paying for repair work to save his home from being condemned and keeping up his monthly mortgage payments, Karl Murtagh (42) decided to get the construction work done and is now €20,000 in arrears. Murtagh, a chef who lives in Co Donegal with his wife and four children, first noticed cracks appearing in his walls five years ago. His family is one of an estimated 4,800 in Donegal affected by the mica scandal – with a further 345 in Mayo. It emerged a number of years ago that the mineral muscovite mica was present in the concrete blocks used to build a large number of properties in Donegal. This substance impacts on the cohesion of the cement content in the block and therefore the durability of the walls. The structural integrity of these properties can deteriorate very quickly and some have already been condemned, forcing the owners to move into rental accommodation while still paying off a mortgage on a house that is not safe to live in. Three years ago, Murtagh said an engineer who assessed the structural damage advised he would have to either get repair work done urgently on one side of the house or move out of it. 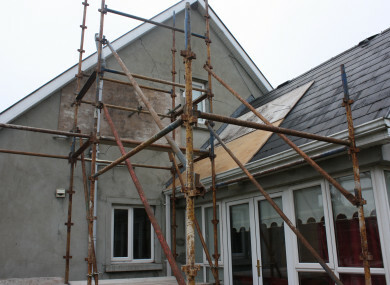 At this stage the house was already being supported by scaffolding. “I really just thought it was the end of the world, to be honest,” he told TheJournal.ie. He applied to his bank for a loan top-up so he could pay for the repair work. He had informed his bank from the start about the mica problem – this was after his insurance company had cancelled his policy when he tried to claim for repair work. Murtagh hired a contractor to do the work anyway and arranged to pay the €17,000 bill to keep that side of the house standing in weekly installments. The bank agreed to allow Murtagh to pay interest only on his mortgage for a short period but when this expired he was required to pay the full amount. In September, he received a letter from Ulster Bank informing him that his loan has been transferred to Promontoria Scariff DAC. The letter stated that the review which led to the sale of Murtagh’s mortgage was part of the bank’s “continuing strategy to create a strong and sustainable bank for all our customers”. His was just one of hundreds of home loans sold to the vulture fund by Ulster Bank. The new mica redress scheme announced by the government will assess the damage to affected properties and cover the necessary repairs. Its announcement came after an eight-year campaign by affected families. When the scheme was announced, everyone else was jumping for joy about being able to get their houses fixed. And I’m maybe €20,000 in arrears. It came too late for us. Murtagh said there is still extensive deterioration in his home that urgently needs to be repaired. He said the government needs to move quickly now before homes deteriorate beyond repair. “Now, time is of the essence, I remember the last storm when everyone was sent home from work and my wife rang asking me could I take the night off – I’m a chef so I work most nights. She thought in the storm the house might not manage it, she wouldn’t be like that usually but she was worried that time. People know their houses are not going to stand another winter, especially if it’s like the last one. David Hall, CEO of the Irish Mortgage Holders Organisation told TheJournal.ie that it is unlikely the vulture fund will come to a sustainable repayment arrangement with the Murtagh family. As reported by TheJournal.ie in August, Promontoria, a subsidiary of Cerberus, has confirmed in correspondence that it is not putting cases forward for the mortgage-to-rent scheme. In another portfolio sale by Ulster bank in 2016, called Project Oyster, loans belonging to 900 borrowers were sold to Cerberus. Its subsidiary Promontoria Oyster DAC has initiated court proceedings in over 100 cases this year – last year it only initiated four cases. The loans in the portfolio Murtagh’s mortgage was part of, known as Project Scariff were sold in August this year. So far, Promontoria Scariff DAC has not initiated any proceedings against affected homeowners and Murtagh said he has yet to hear from the fund. In August, Ulster Bank said the average arrears among the 2,300 primary dwelling houses involved in its sale to Cerberus was €61,000. It also said the average number of missed payments was 49. Hall said Murtagh’s story is an example of the complex circumstances that are often involved in arrears cases, but which are not part of the narrative from banks when they sell the loans. “One of the most difficult things we deal with every day is when people are telling their stories and they are legitimate and multi-faceted. Banks care little and vulture funds care less, that is what they are ultimately up against. I have examples of people who are only in arrears of €3,000 and they were sold to vulture funds. It’s a very difficult situation for people like this man and it’s something that this system has missed – that people are human. This is not just a house and not just a mortgage. There is a whole host of issues people have from personal relationships, finance, health, addiction. And you have cases like this with challenges around structure, fire safety, mica, pyrite. Hall said he is frustrated by the manner in which lenders “demonise” customers, in particular with comments about a lack of cooperation. “Define uncooperative. It could be that the bank said the solution is to sell the house and you said no – that’s uncooperative. “Maybe your ex won’t sign the paperwork to allow them to assess your circumstances – that’s uncooperative. Ulster Bank and Cerberus, of which Promontoria is a subsidiary, did not respond to requests for comment. Email “Mica scandal: Family living in 'falling down house' finds out mortgage has been sold to vulture fund”. Feedback on “Mica scandal: Family living in 'falling down house' finds out mortgage has been sold to vulture fund”.